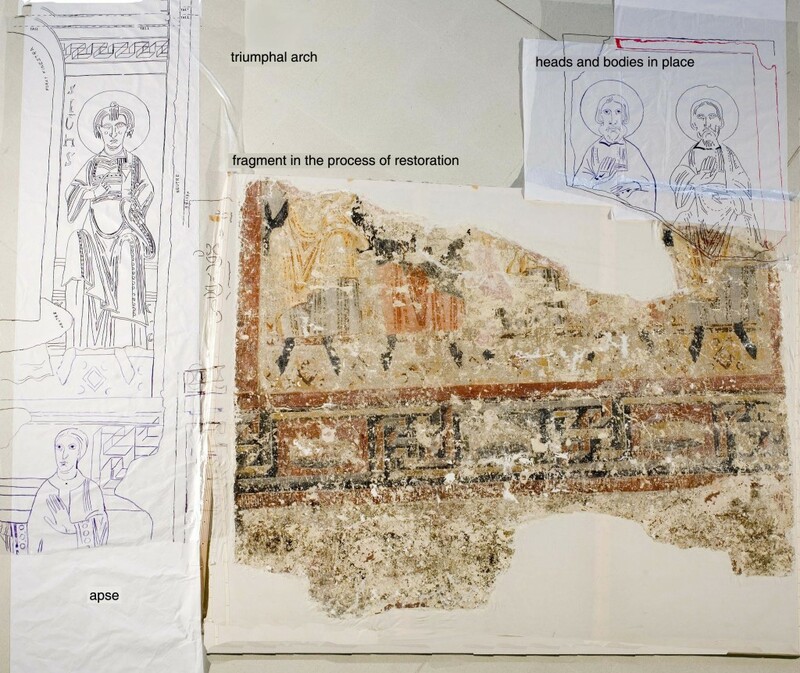 The fragment of mural painting from Sant Pere del Burgal is currently in the process of being restored. 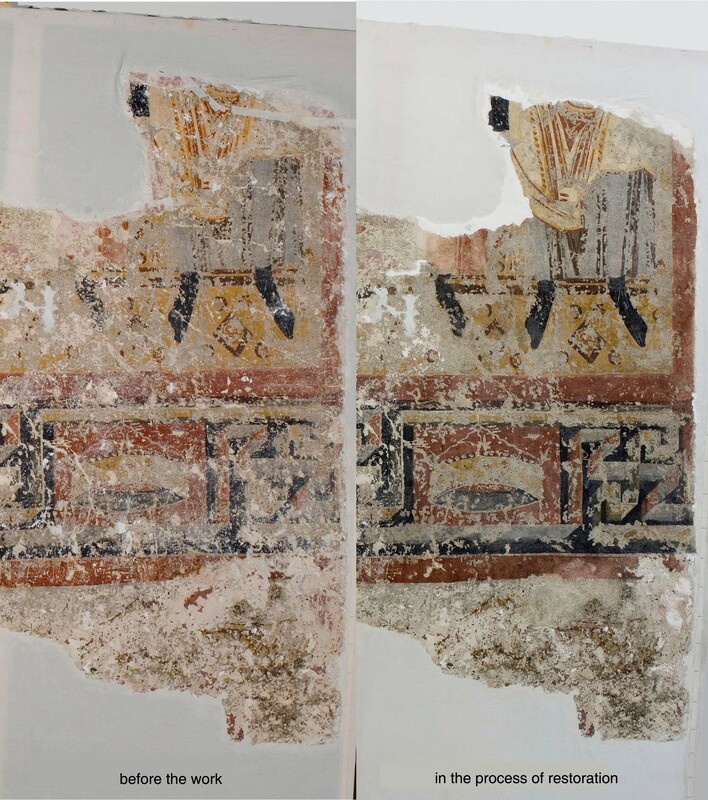 We have been working on this piece for years, studying its place with respect to the apse, the nature of the pigments, the surface materials … always with the idea of being able to insert this large fragment in the permanent exhibition room, as we mentioned in the previous article. Transfer: The transfer canvases set in place in 1964 with calcium caseinate as the adhesive were treated in 1998-1999 due to the bad condition of the canvases and the adhesive. The transfer canvases and the casein used were removed mechanically after protecting the polychromy with gauze and polyvinyl alcohol. Two new cotton cloths, prepared with new calcium caseinate, were subsequently incorporated. Preparation layer: The original mortar is composed of lime and quite coarse-grained sand, and the preparation layer it conserves is very thin, as is normally the case in removals a strappo. Different types of holes are observed with stuccoes, of diverse composition, applied in the various episodes of restoration work since it was removed. 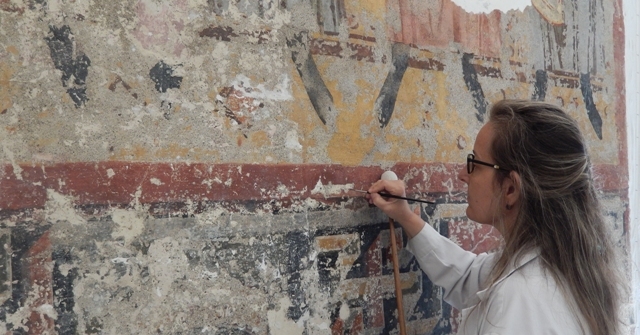 Picture layer: The paint layer is composed of the colours yellow (goethite), red (haematites) and black (carbon) applied to the fresco. White brushstrokes applied as the final decoration are also observed. Both the green and the grey are mixtures of the main colours: the green is a mixture of yellow and black and the grey of black and white. The paint layer, with important losses and areas in which the colour appears exfoliated, are the product of the removal, the materials deposited on the surface and the casein that appears on the surface covering the polychromy. These factors make it hard to interpret the work. Surface materials: On the surface of the work we find traces of different materials; both from before the removal, as a result of the process of stripping it off the wall, and materials deposited in the various episodes of restoration work done. The most significant surface material is lime over the layer of paint applied before the removal. From the different restoration work done we observe materials to consolidate it such as wax (on the surface and in the interior included in the paint layer) or for protection, such as polyvinyl alcohol. Polyvinyl alcohol is found evenly distributed all over the surface with remains of cloth used as a protection layer in the restoration work done in 1998-1999. In 1996 the museum’s chemist, Antoni Morer, took samples of the polychromy from the apse and published the results, based on the analyses done together with Manuel Font-Altaba, in the MNAC bulletin No. I. 1, 1993. They corroborated that the mural had been done as a fresco with pigments such as haematites (red), goethite (yellow), carbon black, and green, which was a mixture of aerinite and goethite. Aerinite is, generally speaking, the blue used in Catalan Romanesque painting, including Sant Pere del Burgal. 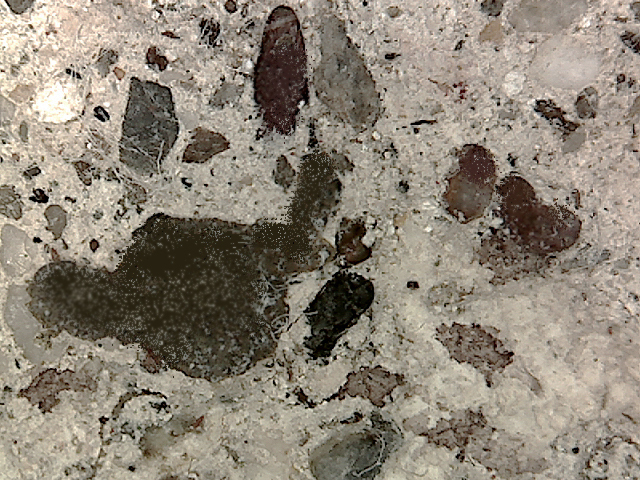 The pigment was obtained from a mineral found in the Pyrenees and was therefore cheap. In the apse from Burgal, however, we see another kind of blue: the azurite used to colour the keys that Saint Peter is holding in his hand. This blue is a pigment that was also used in ancient times. However, it was not found so locally and was therefore more expensive. The problem with azurite, though, is that on a surface prepared as a fresco it alters in contact with the lime preparation. The artist used it to do an important symbolic feature, the keys to the kingdom of heaven, but most of it has been lost. It can therefore be deduced that this blue of Saint Peter’s keys must have been applied a secco and not as a fresco. 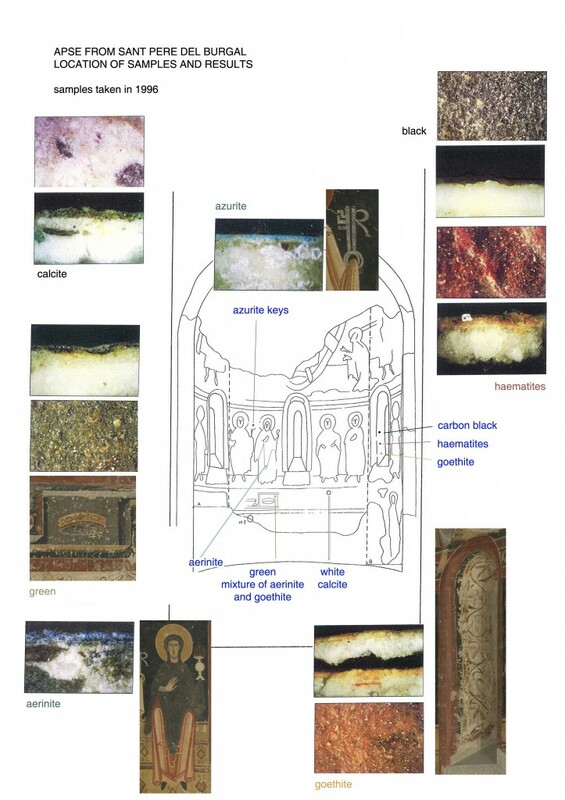 In 2002, with micro-samples of the fragment it was corroborated that the pigments corresponded to the same colours in the apse (1996). In 2009 a composition was done with the different limes (apse, saints in the arch and fragment) to ensure the correct match between them before beginning work on the fragment. The organic analysis of surface materials confirmed the presence of vinyl adhesive mixed with other unidentified compounds, the casein resulting from the transfers, the wax used as a consolidator and the polyvinyl alcohol used to protect the surface. The study of the fibres of the transfer canvases confirmed that they were cotton cloths. The mortars added in previous restoration work (areas of losses of original polychromy or already non-existent areas “in situ”) are of different kinds. They often overlap original polychromy and were applied more thickly than the polychromy. They are compositions of calcium carbonate, a mixture of calcium carbonate and casein; pigment and casein and calcium carbonate and vinyl resins. In 2010 the first attempts at cleaning were made to try to rid the paint layer of the surface materials added, materials that had already become part of the polychromy and of the preparation, and which are hard to remove. In 2014, the biologist M. Àngels Calvo, of the UAB (Autonomous University of Barcelona) Applied and Environmental Microbiology Laboratory made a microbiological study of the paintings. After the incubation of the samples in the right conditions for each type of culture, it was demonstrated that there was no representative microbiological growth. The paintings had to continue within the climatic parameters established by the museum’s department of preventive conservation (22ºC, plus or minus 3ºC during the hottest months, and about 20ºC during the coldest months, and annual humidity of 58%, plus or minus 5%). These environmental conditions have been established to make the needs of the works in the permanent collection and reserves compatible with human comfort and energy savings. Now we can’t wait to see it in the exhibition room!